Miles Ryan lost his wife Missy two years ago, because of a car accident with absconding. Since then the deputy sheriff of the little town in north carolina can't find his inner peace. Merely his nine year old son Jonah brings Miles to feel live as something positiv. At the beginning of the second schoolyear Jonahs new teacher Sarah wants to speak with Miles about the academic performances of his sohn. As Sarah is offering private lessons for Jonah, not only Sarah and Jonah become friends but also Miles and Sarah are getting closer, become friends and are finally a couple. The story is more foreseeable as else. Especially in the first half of the book everything sounds like the nice love novell, you wish. The book is a very easy read. You can read it relaxed and uncomplicated. Merely the rash into the murder mystery direction is not imperative expected, though one has steady a “Something is going to go on”-feeling. That's not made really good or bad, it's just something different and it makes some difference. But it doesn't left you back with the feeling of a genius, inspiring or reflective making novel, like the other storys Sparks is generally telling. 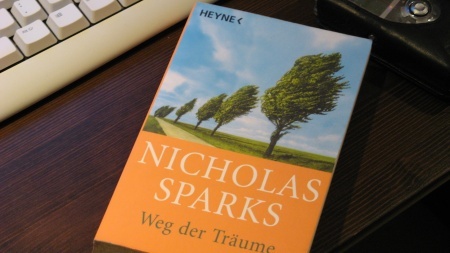 The 320 pages of the german version are the right for a calm, relaxing reading day or for a nice holiday week. But there are better stories out there, even from the same author. That's why I'm giving a average rating for an average book: 2.5 of 5 points.